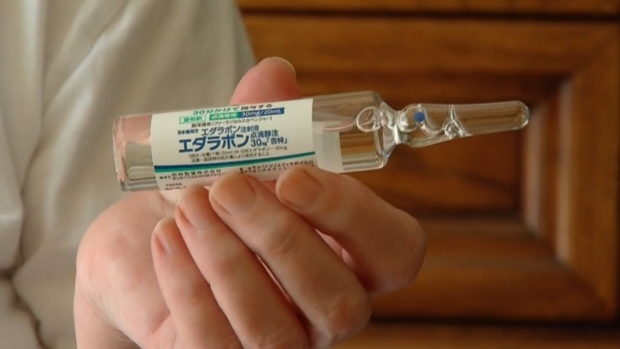 A Japanese bottle of the drug edaravone is seen in this file image. A drug used to slow the progress of amyotrophic lateral sclerosis, or ALS, has been approved for sale in Canada. 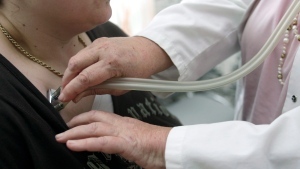 Health Canada has granted market authorization for the drug edaravone, an intravenous medication sold under the brand name Radicava. The drug is already used to treat ALS in Japan, the U.S. and South Korea. Some reported side effects of edaravone include bruising, headache, breathing problems and skin infections. ALS is a fatal neurodegenerative disease in which patients typically become unable to move, speak, swallow, and breathe as the condition progresses. Patients with ALS usually die within two to five years of diagnosis. According to the ALS Society of Canada, an estimated 3,000 Canadians are currently living with ALS. ALS Society of Canada: What is ALS?